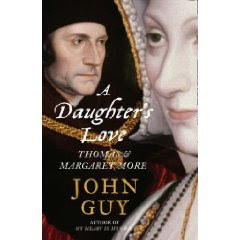 I have just finished reading "A Daughter's Love" by John Guy. The cover tells you what the book is about. It is an excellent read and in spite of Guy's earlier book on More and his distaste for some aspects of More's reactions to Protestantism and the followers of Luther, offers a reasonaby favourable portrait of the saint. Eamon Duffy's review (in The Independent) suggests that Guy's appreciation of Margaret Roper's abilities is OTT, but given the restrictions of the day against female scholars and the undoubted abilities she possessed (recognised by Erasmus as well as her father), it just might be true that she was capable of providing an accurate translation of the Bible to rival the early Protestant attempts. Guy thinks that if the Catholic hierarchy had been more adventurous there might have been an acceptable early "Catholic" translation. However, it is clear from More's own writings and his attitude towards the possibility of Margaret entering the world of publishing that this would have been impossible (sadly!). I have not read Guy's earlier book on Thomas More. I understand it is largely negative. This new book apparently uses more recent research and Guy seems to have mellowed in his approach to the saint. The final chapters of the book do nothing to damage the reputation of More. In fact, because of his "faults" (always difficult to read back from here to there!) More's sanctity and humanity shine. He appears as certainly one of the most enlightened and virtuous men of his day.